The country of Japan is divided into 47 "prefectures" - which are larger than counties or cities but smaller than U.S. states. Each prefecture has an elected governor and is subdivided into cities, districts, and towns. 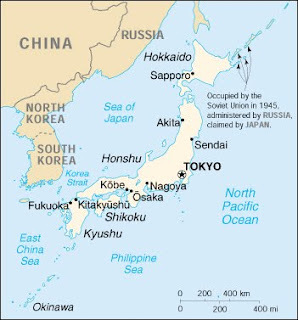 Nagoya (where our our family is called to serve) is the capital city of the Aichi prefecture, located in central Japan (see map below). The latitude of Nagoya is the same as that of central NC. Cities with only one church: 4 (population 39,000 and above). Eastern Aichi occupies the southern tip of the Kiso Mountain Range with plains on the east and west. The climate is mild with a lot of rain, but Winter brings much drier weather. Aichi has the fourth largest population of all the Japanese prefectures. The capital city of Nagoya lies midway between Tokyo and Osaka. It has become an economic and cultural force in Japan. Agriculture is the leading industry with a gross product that ranks sixth in the nation. In 1875 Eikichi Ohara from Aichi came into contact with a Southern Methodist Missionary in Yokohama, was baptized, and returned home. The following year the missionary came to Ohara's home town to start a preaching outreach which resulted in the first church to be established in the region. Today, there are still four cities in the prefecture with only one church each. There are 34 towns and villages in the prefecture that have no established Christian church. Eleven of those towns have a population of more than 20,000. If you're interested in a copy of "Operation Japan" you can find ordering information by clicking here.